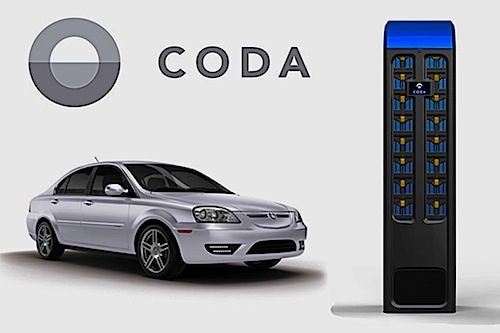 CODA has done a good job beefing up the Chinese partially manufactured car and the NHTSA awarded it them 4 stars. Now it needs to improve its driver crash rating. When people find out the electric CODA is partially manufactured in China by Great Wall Motors, it usually stirs images of poor quality and craftsmanship. This is something CODA was well aware of when they brought the car into the US and have worked hard making sure it would withstand the tough and stringent NHTSA testing. 4 Stars And 2. The good news is that CODA has done its homework well and the test crash of the first few cars have yielded an overall impressive 4 stars out of 5. The bad news is that the CODA fell short of the 5 stars because the driver crash test dummy didn’t fare very well. It only got 2 stars on the head on, straight forward impact. Note that the passenger side received 4 stars. So what does this mean? It probably means CODA is going to back to work and make the car even better. Does Chinese Have To Be Bad Quality? This is something I’ve often wondered. Is the so-so quality from Chinese products and Western companies manufacturing them in that country inherently bad quality or are companies asking China to make cheap products by cutting corners giving us poor quality in the end? If so, then why do we Westerners purchase such poor quality from China in the unrealistic hopes of saving money with shoddy goods? Wouldn’t China be held to higher manufacturing quality if we rejected poor quality and embraced higher standards? You probably get what I’m driving at, after all ancient Chinese art work predate our Western societies and show an unparalleled level of quality and marksmanship. Why can’t it do the same today? In CODA’s case, the deal inked with Great Wall Motors for the car they manufacture and sell there is none other than a 2002 Mitsubishi, a Japanese company more known for its overall quality then poor bad products. It seems CODA saw a solid platform in it and just needed to beef it up in order to meet today’s tougher standards. NHTSA Recall. According to AutoBlog, the NHTSA has issued a recall for the 2012 Coda over its side and window airbags. It will be interesting to see how CODA handles this situation. If my talks with them are anything to judge, we can be sure the company will be more than quick to handle the situation correctly. CODA knows it has a small window of opportunity making an impact in the electric vehicle, EV world and can’t take any chances developing a poor quality image. http://www.torquenews.com/1079/coda-energy-teams-stem-smart-energy-optimization-system so we can be sure it will leverage it’s other two arms in case things go awry. In the meantime, we can congratulate CODA on its NHTSA 4 Star rating and look forward to the final product.